We had a marvellous afternoon at Silverstone last Wednesday for Formula 1 testing, and excellent hospitality from Renault Formula 1. The weather (a bit rainy) got in the way of a full test of the dry-weather Michelin tyres but, apart from that, all of the constructors testing that day (RF1, McLaren, Honda, Toro Rosso, Williams, Toyota, Red Bull, Midland F1) gave the cars a good thrashing. 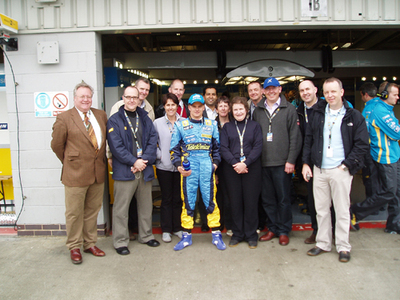 The clients I hosted all had an excellent time, with the added bonus of meeting Fernando Alonso and Heikki Kovalainen (Renault's third driver). A chance to race the simulator around a computerised version of Silverstone proved a hit with several of us, although it's clearly apparent from our performances that Fernando and Giancarlo's job's are safe! The afternoon also provided us with a chance to explain what Xansa do for Renault as their Official Software Services provider - everything from IT architecture, through to the maintenance of their off-car telemetry systems, and help with their SAP systems. 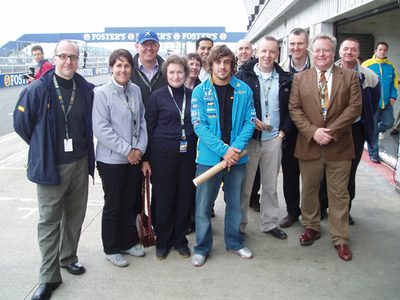 A couple of mementos below show the gang with Fernando Alonso, and with Heikki in front of the Renault pit garage and the R26 (this year's car).